Computational Fluid Dynamics is a commonly applied tool to provide solutions for fluid flows with or without solid interaction. In CFD analysis, the check of fluid flow in accordance with its physical properties such as velocity, pressure, temperature, density and viscosity are shown. Incorporating Computational Fluid Dynamics (CFD) analysis into the design process can help companies achieve aggressive product performance requirements needed to secure market share in today’s competitive landscape. 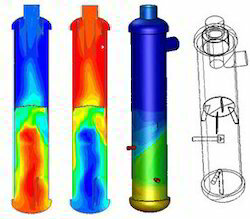 We Provide -CFD analysis which helps in optimum identfication of CO sensors and jet fans location. We follow International Standards and latest NBC codes to provide report. Akuva Infotech Private Limited provides expert CFD Thermal analysis services as part of heat management and thermal analysis. Our research engineers execute combined CFD and conjugate heat transfer analysis. 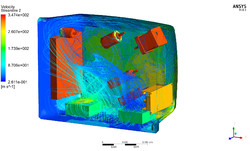 Using the most advanced software tools for modeling fluid flow, We can solve your convection heat transfer problems and deliver improved thermal designs. Computational Fluid dynamic (CFD) is a powerful predictive tool used in combustion research. CFD is used for evaluation and optimization of burner and OFA port sizing and location. The numerical modeling provides the detailed boiler performance information that could not be obtained through physical modeling or plant testing. We are also ofering CFD Analysis. Many problems needs combine expertise of FEA and CFD to simulate it for actual working conditions. CFD analyses within following areas are performed for various applications. Complete solution for automotive-aerodynamics, front end analysis, thermal mapping and management etc. Study of stress distribution, Pressure distribution, Design optimization, Structural and Thermal analysis. Building a prototype and checking whether you concept works in real time environment is not the solution. After advancement in MCAE tools building your prototype in MCAD tools and checking it in MCAE tools is most recommended and time and resource saving way. We provide conceptual FEA training to corporate, individual and other types of customers.